"An insightful, well written and helpful memoir." The Columbia Review. 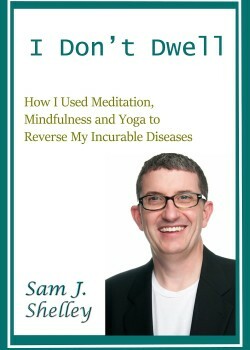 In this well written and sincere memoir, “I Dont Dwell; How I Used Meditation, Mindfulness, and Yoga to Reverse My Incurable Diseases,” author Sam J. Shelley describes his challenging early life, beginning with a ruinous car accident as a child, followed by severe physical and mental difficulties well into adulthood. Having been diagnosed and treated not only for his physical injuries, but for severe depression, bipolar disorder, and debilitating migraines, he was eventually diagnosed with Multiple Sclerosis. That last health setback was an aggressive case of MS that was causing serious limitations on his daily functions and was progressing unevenly, as this cruel disease often does. But then, beside his determination to regain physical strength and mobility, the author embarked on a journey of self-discovery, not only in reflecting deeply about how his life has evolved over the decades, but more so, an exploration of the interrelatedness of mind and body and the potential healing of both through it. As the author attests, his physical health has gone from very poor to perfectly excellent, his ailments were gone, and his medicine cabinet was wholly vacated. Mr. Shelley’s writing is refreshingly unassuming and brutally honest. He shares with the reader his most revealing spiritual and metaphysical discoveries, as well as his journey into the world of Zen and meditation. By inviting his readers into this intimate series of experiences, the author delivers a precious gift of insight and understanding, as well as ways to apply the lessons in the reader’s own life. Some of the areas covered may seem at first familiar. Healthy food and drink, physical activity, limitation on medications, the downside of caffeine excessiveness, and the avoidance of the needlessly hyped news channels that “added to the mental noise of life, which sapped energy from my being.” Truer words have never been spoken. Perhaps the best part of the book is the exploration of how the physical human body is the vehicles for “carrying my soul around.” This part of Mr. Shelley’s journey is a fine combination of spirituality and practicality, presented with great clarity in this thoughtful and thought-provoking book. For example, the author shares a wonderfully revealing experience of searching for clues in photographic images of himself through the years, as the body’s appearance revealed the internal and spiritual challenges—and the consequent transformations. In summary, this unique book will keep readers’ interest by sharing an eventful life story, filled with trials and tribulations, interspersed with the valuable lessons that the author had gained through overcoming those challenges. Mr. Shelley’s commentary about modern life and the incessant noise of electronic communications and media, rings true even to those whose hearts beat faster to the sound of electronic pings and who willingly submit to the constant immersion in news and tweets. “I Dont Dwell; How I Used Meditation, Mindfulness, and Yoga to Reverse My Incurable Diseases” is a worthwhile book. It will make you think about ways to improve your own life, or, at the least, “have compassion for yourself.” Highly recommended.